What is Hybrid Cloud Model? Let’s find out! A hybrid Cloud is an environment of Cloud Computing in which organizations, residing in that environment, provide and manage some of its resources in-house and has other resources provided externally. Technically, Hybrid Cloud is the composition of both the Public and Private Clouds. As an example consider an organization that uses a public cloud service, such as Amazon S3 to acquire archived Data but continues to use and maintain in-house storage for its operational customer data. Ideally, the Hybrid Cloud allows users to take full advantage of the scalable and cost effective environment of public Cloud without any security concerns. 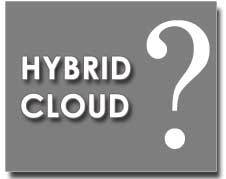 Hybrid Cloud Computing – What’s the Use of It? Hybrid Cloud is beneficial for those businesses who wish to showcase some of their services to the public in general, and manage their confidential data on the private Cloud. However incorporating Hybrid Cloud accomplishes several goals as well. Hybrid Cloud takes the existing aspects of I.T infrastructure such as storage and computing peripherals to the Public Cloud environments, and the remainder stays on the premises. Although some say it’s efficient to move operational data on the cloud but many find the Hybrid approach of keeping the Data Local, much more practical. Using a Hybrid Cloud is a valuable approach as you can mix and match the resources you require between infrastructure that is inexpensive, scalable and provisioned according to your requirement. Managing server downtime is another issue which can be resolved through Hybrid Cloud. This is another attribute which business entities procure while monitoring their projects on Hybrid Cloud Computing. Considering performance issues and security restrictions, Hybrid Cloud computing acknowledges to the fact that not all I.T resources are meant to be kept on Public Cloud, today. Hybrid Cloud Model helps us understand that, which data can to be kept locally, and which to be executed remotely. Some of the new Hybrid Cloud providers even proffer complete management and system administrations. This attribute further enhances the credibility of users in leveraging their Hybrid Cloud. Hybrid Cloud Model – Is it the Best Option Available? It was a common belief amongst individuals and organizations about Cloud being being a stable, unique and hassle free technology. But the famous AWS EC2 (Amazon Web Services Elastic Cloud Compute) collapse created a sense of panic among users who had been using Cloud services from AWS, Google and Microsoft. This was an ordeal which lead to the strengthening of core foundation of a cloud model. This was when Hybrid Cloud became omnipresent and boomed in the industry. As Hybrid Cloud lets users store data in two different Cloud infrastructure i.e. Public and Private Cloud, Concerns over the downtime of an online presence were abolished. This is one of the Prime benefits of Hybrid Cloud that organizations can enjoy because if in-case one Cloud server goes down the other one is there to support the ongoing processes. Hybrid clouds are increasingly evolving in the IT industry. As the number of aspiring Cloud venture exceeds, demands for Hybrid Cloud increase too. The end-game being: Organizations and individuals will enjoy a stable cost effective, scalable and a green Cloud environment.